I didn’t make this film with my passport. I made it with my heart. Experience is a comb for the bald man (or a lantern carried behind you). The first co-production between China and France by a French director, The Nightingale, a bright and charming portrait of a plucky Beijing girl at odds with her devoted grandfather, has been submitted by China as a contender for the Best Foreign-Language Film at the 2015 Academy Awards. 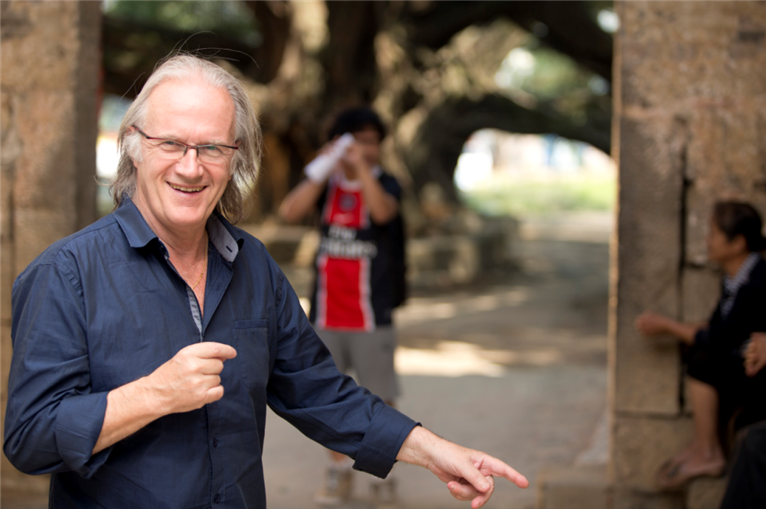 Writer-director Philippe Muyl shows us three generations of a Chinese family today constantly on the move, by jet and car for the parents and by rail, bus, boat, and foot for the feisty rascal of a girl, Renxing (newcomer Xin Yi Yang) and her sagely persistent granddad, Zhigen (veteran Baotian Li), who shows her his old home. I met with Philippe Muyl in Santa Monica and we sat down at a café table in the sunny outdoors to talk about all that he experienced — expected and unexpected — in making The Nightingale as a Frenchman in China. KINOCaviar: How did you get the idea to make this film in China, and in Guangxi, facing both Mandarin and the local dialect? What did you learn most about living and working in China? At first they wanted me to re-make Butterfly, but I didn’t want to do exactly the same thing, so my new film is ‘inspired by’ Butterfly. 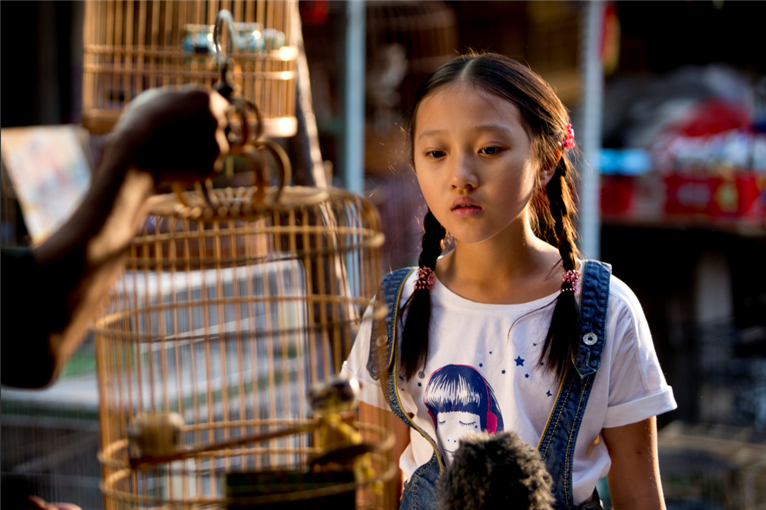 A story between an old man and a little girl is very important in China; that’s why Butterfly was such a big hit. The family itself is more important in China than in France or the U.S. because there you have the tradition of three generations living together in one household. You also have the law of one child allowed per family, but now that’s changing: if a man marries a woman from one of the 55 ethnic groups in China that is non-Han in cultural identity, he is allowed more children. A boy is considered very important for a grandfather because that boy will support the man in old age (whereas it is assumed the girl will marry out into another family). So in 2010 I set out on this project and began to study Mandarin, first in France and then in China. I began to travel through the country and meet people and spend time there. What I learned is that everything is so different! The biggest difference in making a movie there is the organization — the non-organization. If there’s a problem there, they never admit it. So if you know that, you can get used to it, but even now I’m suspicious. KC: Who is the audience for your film? It often feels like a fairy tale (bamboo forests, waterfalls, mountain vistas, terraced rice paddies, a river) or a lullaby (the flute, the nightingale’s songs) — not even a picaresque road movie because nothing ever harms this girl or even threatens her. Do you imagine children watching it? PM: In the marketing concept, there’s a culture gap: the Chinese don’t have ‘family movies’ as we pegged this one. Old people still see old movies on big screens, outdoors, in the countryside; it’s their way. Young adults (ages 18-30) who see European films watch them on their computers or tablets (there was a pirated copy of The Nightingale in China one week before its release there). They view Chinese or Hollywood movies in the theaters. Young kids watch movies on their cell phones — they never go to theaters. In general, the Chinese audience is very young: 95% of the viewers are between 18 and 30 years old, and the tickets are very expensive for them. They range from the equivalent of $4 for 2-D films to $15 for 3-D films. A film like Interstellar will cost upwards of $12. Now you have to take into consideration that the average salary in China is one-fourth that in the U.S. This young audience chooses mostly Hollywood-style movies, kung fu films, Hong Kong movies, action pictures. John Woo films capture 50%. KC: How did you choose your location? Had you ever been there? Is it one location in the countryside, or several, and how far apart? PM: In 2011 I stayed six months in Beijing. Then I went to Yunan, thinking to make the film there. In 2012 I went to Beijing again, that time for nine months, and I traveled to Guangxi, next to Yunan in the south of China, near the border with Vietnam. I moved around a lot, and could easily have spent three years traveling, but I decided to use Guangxi as the location for the old home of the grandfather. The languages didn’t work. In the north of Guangxi, they speak only in their own dialect, so we needed a translator for the dialect alone. From the north to the south is about 1,000 kilometers. We covered all of it. KC: The landscape is very lush and the shots, often wide and deep, are beautifully composed within the frame. The film feels like a series of landscape paintings. Did you want to evoke any particular era or style of image? PM: In my first life, I was a graphic artist. I thought I forgot everything, but maybe not. All my life, I’ve lived in big cities. Yet I love nature. And it’s instinctive for me to frame whatever I see, and I love doing it. KC: There is a novel scene in the film’s opening of cross-cutting between the cars of the mother, father, and the daughter in which they all try to “reach” each other via their very up-to-date “smart phones,” but none can succeed, because their calls jam their “air waves.” Is this more about an obsession with technology or a lack of communication in the family? How much does it speak for China today (as opposed to France or the U.S.)? PM: The scene is about both the issues you mention. More than in France and more than here (the U.S.), people there are on ‘We Chat” all the time — a very Chinese application for direct dialogue. I didn’t use it on the set, but I do now, for discussions with Chinese film producers. They like it. The Chinese are great at social media. At the same time, there is a big generation gap in China, because old-style grandparents are raising the kids while parents work more hours and further away than ever before. Also, the organization of work schedules is very bad. Chinese parents work from 7 a.m. until midnight. Everyone wants to be rich, and the rich want to be richer. It’s like everywhere else, but in this case, it’s China, so it’s new for them. KC: How did you decide on the time-lapse shots of traffic in Beijing? They are a departure from the real time of the rest of the film. PM The technique is to show the contrast between big cities and the countryside. In Beijing, cars are everywhere. It’s crazy. On one day a week, you’re not allowed to drive. You get a government number for your day. There were not so many cars in Guangxi, but now if I went back, I’d see the difference from two years ago in the number of cars and buildings. From Beijing to Guangxi is 30 hours by train, and you see new buildings all along the way. KC: How did you direct an all-Chinese-language film? Did you know Mandarin? Did you know any southwestern dialect? Did you have a Chinese assistant who spoke French? 2nd A.D. was from mainland China and spoke Mandarin and French. We spoke five languages, because there was also the local dialect of the ethnic Chinese in Guangxi. But mostly we spoke Mandarin, and there were no real problems. KC: What gave you the idea to embark on a co-production? How involved was the Chinese government in funding and overseeing the project, and at which stages — screenplay, production, editing, distribution? Why did China accept your proposal to make this film? PM: We got no money from the Chinese government, and we got no money from the French government. The Nightingale was made only with private money, with no help from any country. In China this is normal, but in France, we have lots of ways of getting grants, and we applied, but we got none. That’s why we had lots of problems, because we had very little money. At the end of shooting the film in 2012, I went back to France and had to wait five months to begin post-production since the money was gone. The budget was 2 million Euros. KC: Are the labor conditions for cast and crew (length of the work day, number of work days per week, overall length of shooting schedule, rate of pay, meals, etc.) different in a Chinese film production from those in making a French film? PM: We had two or three French technicians on the crew, for the sound, and sometimes we said to the Chinese crew, ‘Don’t work so much — you need some laws to protect you’. But on the film we did work long hours, 5 a.m. to 11 p.m. sometimes. Crazy days! In general at any work location, you see Chinese people sleeping — on the ground, on benches, on the work site — because they work so long. But they are very quick to work, they work hard and well, and they are very kind. KC: Has the film been shown in China yet? Where? What was the reaction? What about France — what is its distribution there? PM: It was shown there, but it was difficult at the beginning, because there were not enough screens for us, and they really liked it. They told us, “If we hadn’t seen your name, we would have thought it was a Chinese filmmaker.” The film has been sold to YQYI, a big, important platform for streaming, only in China. KC: Had the Xin Yi Yang (who plays little Renxing) acted before? What was it like to work with her? Are there special restrictions for working with children in China? PM: She had acted a bit in TV, but not much. She’s clever, kind, funny — I was very lucky to find her. I saw 200 girls through the audition, and that’s not a lot. In China there are no laws about working with kids. KC: Is Renxing overly self-assured in the film because of the “one-child-per-family” law in China, or because of the “new prosperity” in Beijing? Did her parents already have one child? How was it that they were allowed another? PM: Both reasons apply. Because of the one-child-per-family law, a little boy (and not so much a little girl) is like a small king in a family. This is worse when this family has a lot of money. Then a child can get anything and his parents can spend a lot of money on him. The little girl in the movie is not a caricature. The reality is often more spectacular. KC: The level of technology in the countryside seems to be not far behind that of China’s big cities in terms of telecommunications? Will it catch up soon, even if rural homes don’t have other modern conveniences? 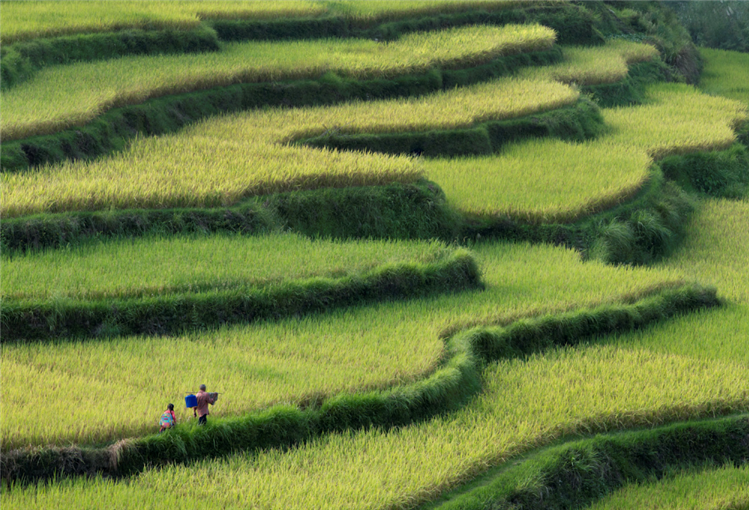 What is most lacking in remote and rural China today? PM: You can use a mobile everywhere in China (it's better than in France, for example). When you visit a small village, you can see the houses are pretty empty, but... there is a flat-screen TV in every home, and everybody has a mobile phone. And everywhere you can ask for the password to get a Wi-Fi connection. We could say that, even in small villages, people are connected with the technological world. 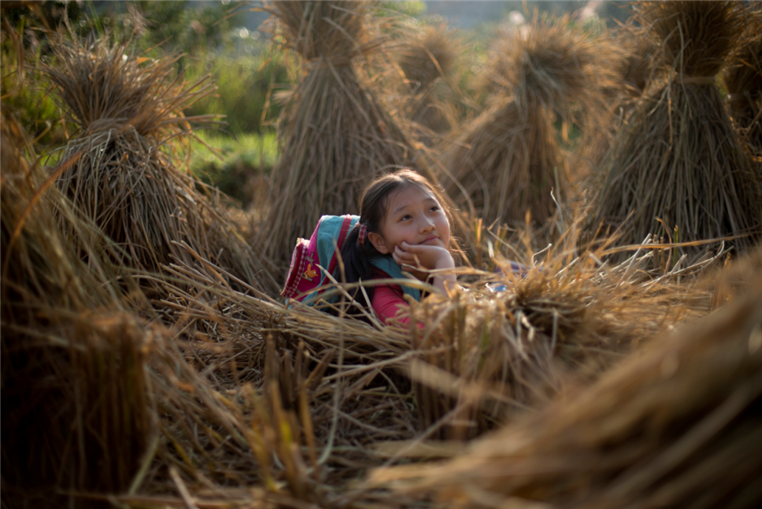 KC: Is there really a difference in ethics and values among rural people today compared to those of China’s city dwellers — or is it maybe just the pace of living that varies? Is there more freedom in the countryside, as there seemed to have been since the Cultural Revolution? Or is that lack of sophistication or conformity really debilitating? Is the quality of education and health and standard of living the same in the cosmopolitan cities and the countryside? PM: It's like in a lot of countries. People want to leave the countryside to find what they think would be a better life: more money, more comfort, which is like a dream because for these people, living in a big city is very hard. They even need a kind of ‘passport’ to get the right to stay in these cities. About education, people need to go to big cities to study. The situation that I describe in the movie is the reality: a peasant left his small village with his son to permit him to go to the university. KC: What are the cultural (ethnic) differences in the region, between the Zhuang and Han Chinese? What surprised you the most about the people or life or conditions or work there? KC: The girl can part with her iPad fairly easily because her parents can and will replace it. What would be a bigger sacrifice for her in trying to please her grandfather? PM: This is already a very symbolic ‘abandoning’. She gives up this very precious object to buy a poor little bird! The material aspect is not important. What’s important is the symbol. KC: Do you think Chinese audiences notice more disrespect on the part of the girl toward her grandfather than French or American audiences do? KC: What was the biggest challenge for you in making this film — writing or shooting or directing the actors? Or was that challenge something else? PM: Shooting the film and directing the crew and actors wasn't so difficult. The biggest difficulty of this movie was the money. During the shooting, I got at least 10 texts (sms) telling me, ‘We’re stopping shooting, we don't shoot tomorrow, we don't have any more money.’ This film was a pleasure, but money-wise, it was a nightmare! KC: What was your approach to music in the film? Why? PM: I didn't want Chinese-style music. I wanted something very light, elegant, subtle, and universal. Armand Amar, who composed a lot of music for film, was the right one to work on it. KC: Had you seen other films recently co-produced with China, such as the romantic comedy, Shanghai Calling? Had you seen other Chinese films about trips from the city to the countryside by directors such as Zhang Yimou (The Road Home, Not One Less, Riding Alone for Thousands of Miles)? PM: Yes, in Guangxi, a lot of people have never seen the sea. But it's the same case in a lot of countries. Still now, in some very modern countries, a lot of people don't move. I know people in France who have never gone to Paris. Such a small country!!! KC: Is the film in the end a parable in which the nightingale symbolizes not even the girl but her father who, having lost his mother (and previous child), needs to gradually “learn to sing”? Director: Philippe Muyl; Producers: Ning Ning, Qin Hong, Paul Delbecq, Steve Rene; Screenwriters: Philippe Muyl, Ning Ning; Cinematography: Sun Ming; Editors: Kako Kelber, Manu de Sousa; Sound: Yves Osmu; Music: Armand Amar; Costumes: Tania Shebabo-Cohen. Color, HD, 100 minutes. In Mandarin, Guangxi-dialect Chinese, and French with English subtitles.